Biomedical research with potential benefit to patients often doesn’t reach the market because of lacking product development expertise combined with inadequate funding. In particular, the translational phase from basic scientific research towards product development may be inadequately funded by public funds, and is too early for private, commercial investors to step in. This is a missed opportunity because later stage investors bring not only funding but also product development expertise and focus to the process. Scientific research focuses on new discoveries and new technologies as measured by publication output. On the other hand, development of a new pharmaceutical products focuses on the patient, the product and the feasibility to bring the product to the market, with improving human health and societal benefit as a measurable output. Basic scientific biomedical research is mostly funded by public funds, while product development is funded by companies and other private investors. Private investors mitigate risk by stepping into the development pipeline at a later stage. Consequently, the gap between public and private funding increases. 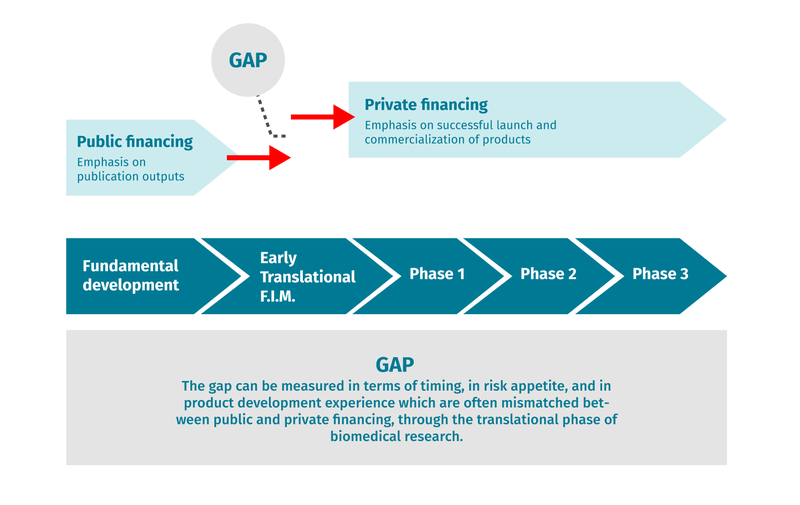 This gap can be measured in terms of timing, in risk appetite, and in product development experience which are often mismatched through the translational phase of biomedical research. The Council of Experts is chaired by the Portfolio Manager. The delegates are experts in the field of medical patents, charities, government, pharmaceutical industry, academia and investment management. Additional expertise is available from a wide range of international experts.